In an outstanding defensive battle, Anadolu Efes Istanbul improved to 4-1 in Top 16 Group E by edging Zalgiris Kaunas 56-52 at home on Friday. Efes grabbed its fourth consecutive win in Group E. Zalgiris dropped to 1-4 and registered its third road loss in this year's Top 16. Sasha Vujacic paced the winners with 12 points. Josh Shipp added 11 while Dusko Savanovic and Jamon Lucas each had 10 for Efes. Tremmell Darden and Mindaugas Kuzminskas each scored 10 for Zalgiris. 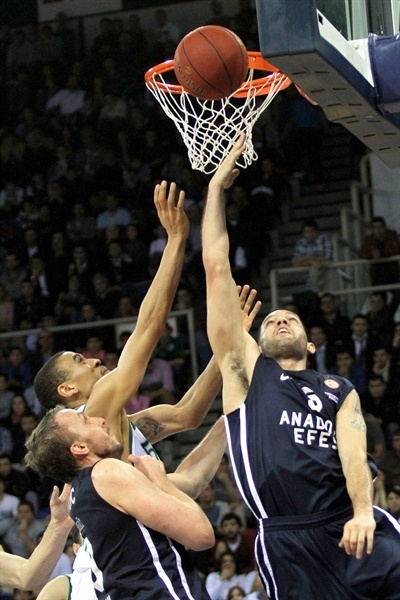 Efes held Zalgiris scoreless for the opening five minutes, as Jordan Farmar led the hosts to a 7-0 lead. Shipp and Vujacic helped Efes to keep an 8-point lead after 10 minutes. An outstanding Lucas saw Efes boost its margin to 25-15, but Kuzminskas kept Zalgiris within 27-23 at halftime. Lucas and Vujacic allowed Efes to extend its margin to 41-34, but a 2-15 run gave Zalgiris a 43-49 lead with four minutes to go. Efes found a go-to guy in Savanovic, who downed back-to-back three-pointers to ignite a 10-0 run that put Efes ahead for good, 53-49. In the end, Zalgiris missed two close shots that could have sent the game to overtime. Shipp sealed Efes's win from the foul line. 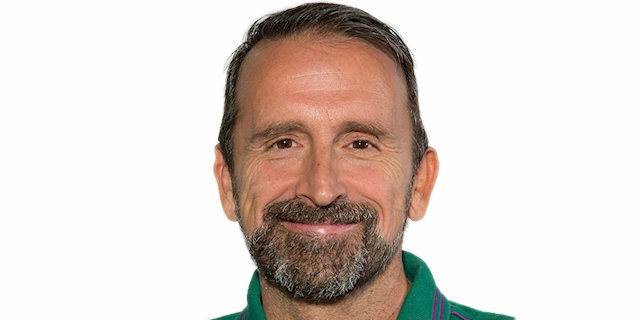 Zalgiris tried to open the floor from the very beginning, placing Popovic and Darjus Lavrinovic in its starting lineup. Lucas got Efes going with a baseline jumper, as the hosts held the Lithuanian champs scoreless for the opening four minutes. Jordan Farmar split free throws and added an acrobatic layup for a 5-0 lead. Farmar kept pushing the hosts with foul shots, while Zalgiris missed six shots and picked up 3 turnovers until Darjus Lavrinovic scored down low. He didn't find much help, however, as Zalgiris kept missing open shots. Josh Shipp scored his first points before a free throw by Darjus Lavrinovic kept the guests within 9-3. Darden nailed a five-meter jumper, Vujacic swished a fallaway shot and an alley-oop layup by Shipp boosted Efes's lead to 13-5. 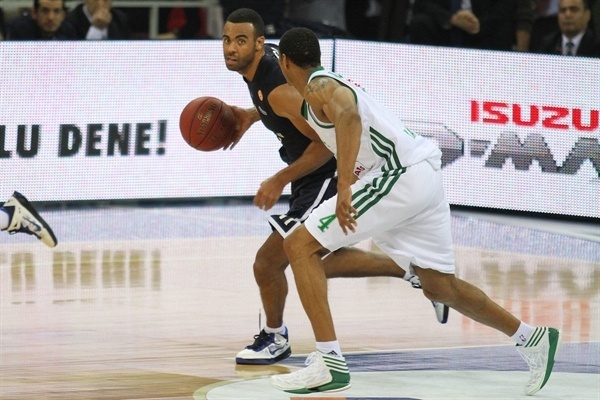 Darden struck from downtown, but Vujacic made free throws to restore a 15-8 Efes lead at the end of the first quarter. Oliver Lafayette fed Ksistof Lavrinovic for an easy layup early in the second quarter. Vujacic ignited the crowd with a three-pointer, but Kuzminskas quickly answered from downtown to keep Zalgiris within 18-13. A red-hot Vujacic buried a corner triple, as Efes tried to use shorter possessions to find easier shots in transition. 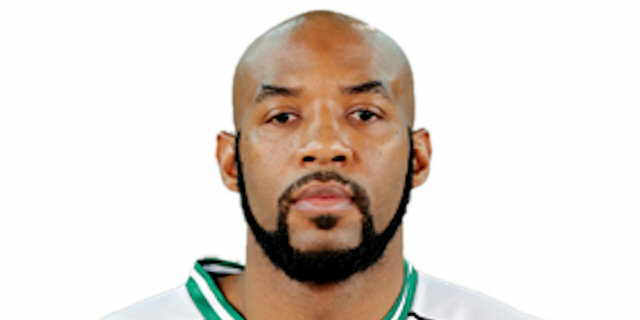 Mario Delas stepped up with a baseline jumper, as Zalgiris improved its defense midway through the second quarter. Lucas took over with a great steal and a high-flying tip-in at the other end. Lucas then sent a bounce pass to Kerem Gonlum, whose easy basket resulted in Zalgiris coach Joan Plaza calling timeout at 25-15. Kuzminskas tried to change things with a jump hook, which Gonlum matched with a tip-in. 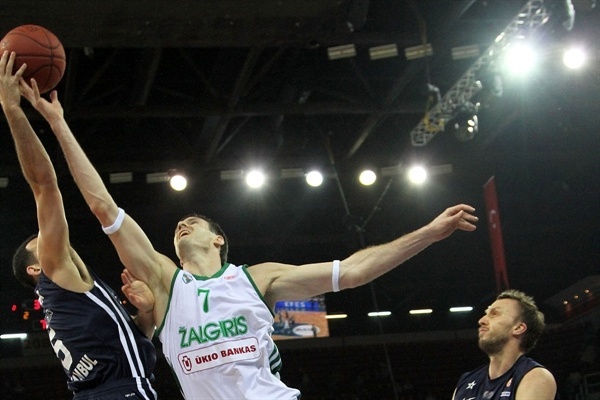 Marko Popovic shined with a floating layup and Kuzminskas brought Zalgiris back to life. A foul shot by Ibby Jaaber fixed the halftime score at 27-23. Third quarter: Defense, defense, defense! Jaaber dunked off a steal immediately after the break and Popovic beat the shot clock buzzer with a one-handed jumper that tied it at 27-27. Dusko Savanovic found space for a wide open three-pointer, but Popovic fed Paulius Jankunas for a backdoor layup. Lucas rescued Efes with a corner triple that gave the hosts some fresh air, 33-29. Zalgiris dominated the offensive boards, but shots did not fall in. 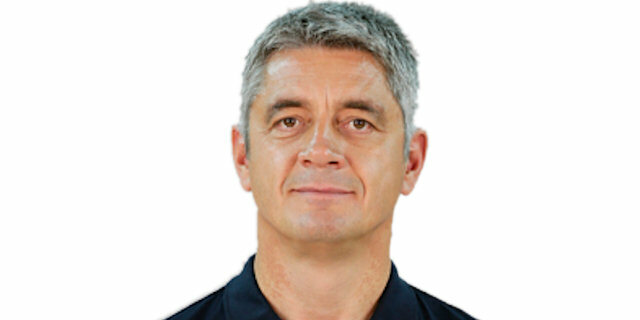 Meanwhile, Shipp gave Efes a 6-point lead. Lucas stepped up with a fast break layup that Darden bettered with a three-pointer off a timeout. 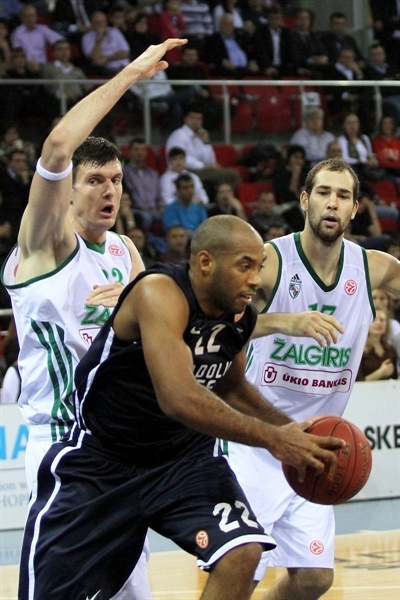 Zalgiris excelled on defense, forcing Efes to take tough shots. Ksistof Lavrinovic took over with a catch-and-shoot six-meter jumper, Vujacic nailed an off-balance shot and an acrobatic basket by Semih Erden boosted Efes's margin to 41-34. A close basket by Darden kept Zalgiris within 41-36 after 30 msinutes. Lafayette shined with an off-balance three-pointer - and the free throw that came with it - early in the fourth quarter. Erden stepped up with a put-back basket, which Lafayette erased with a driving layup. 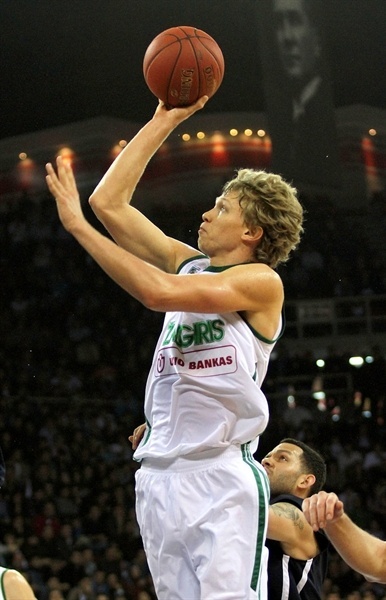 A fast break slam by Kuzminskas gave Zalgiris its first lead of the night, 43-44, with over seven minutes to go. Ksistof Lavrinovic followed a backdoor layup off a timeout with free throws to cap a 2-15 run that gave Zalgiris a 43-49 lead with four minutes to go. 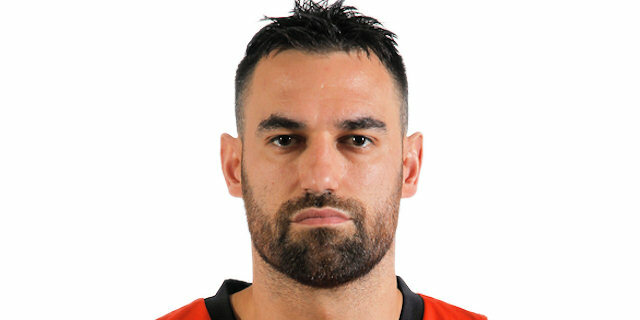 Efes had been held scoreless for five minutes, but Savanovic, who had downed just 1 of 12 shots until that moment, buried back-to-back three-pointers to tie it. Shipp joined the three-point shootout, as Zalgiris could not find the way to the basket. The guests fouled on Lucas, who split free throws with 24 seconds to go. Popovic buried a running triple and quickly sent Savanovic to the foul line with 15 seconds left. He split free throws, Lafayette and Darden missed around the basket. Shipp swished free throws with 2 seconds left to allow Efes to celebrate a tough home win. "It was a very tough and tense game for both sides. We are glad to have come back and won this game. The challange between the teams very really impressive all throughout the game. Neither side let the other to relax for even a minute. We could have had a better differance in the game, especially in the first half. Zalgiris Kaunas made a great comeback in the middle of the last quarter. It was not easy to respond at that time. But my players were confident and made a great step to get back in the game. I have to give credit to my players, who did an excellent job." "Both teams were aware of each other before the game. Tonight we lost the game due to our poor shooting performance. We have really suffered in the Top 16, since the first game until now. We were unlucky against Real Madrid and Panathinaikos and finally against Anadolu Efes. But we will never give up the fight. We will stick together, keep on playing our game to win the rest of the matches in our group. The only thing clear is that we have to lessen our mistakes." "We are very happy to keep winning. It was an extraordinary night for both sides. The high level of the defensive limited the performances in offense. The key for us was our discipline, reaction and challange in defense when we were 6 points behind. We really did the small things well and deserved to win tonight." "The main reason we lost the game was our weak performance inside and outside the arc. Despite having a terrible shooting game, we had a great chance to win the game in the last quarter. The 3 straight three pointers were too much to handle in a limited game like this. Congratulations to Anadolu Efes. We will try to find our winning form soon."